A visual artist’s daylong movie montage returns to chronicle the hours and the times. “I mean, it’s not a film,” says Christian Marclay, in what can only be described as the soft-spoken Swiss artist’s version of raising his voice. (This means that the 57-year-old, calling from a gallery in London, has gone from using a barely audible whisper to an actually audible one.) “With cinema, there’s usually a beginning and an end: You experience an event that starts at this time, is over at this time, and then everyone files out together. With this, you can come and go as you please; you can stay for five minutes or five hours. I’ve been asked many times, ‘So when does this thing start? When does it end?’ It starts when you begin watching. It ends when you leave the room." 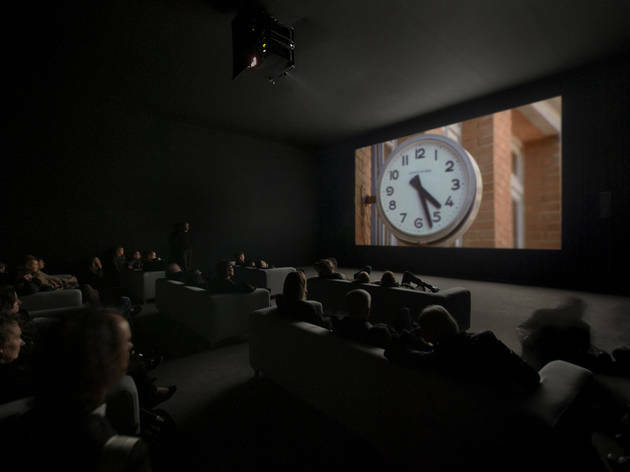 Marclay is certainly correct when he claims that The Clock, the 2010 artwork that has played around the world and won the Venice Biennale’s Golden Lion award last year, shouldn’t be considered, categorized and consumed in the same manner as a typical movie. But the declaration is also a vast understatement. This 24-hour installation piece is not a film, but is, in fact, thousands of different films, reduced to decontextualized, cut-up fragments and spliced together into one sprawling yet intricately coordinated montage. Each shot is united, however, by virtue of it marking time: The clanging bells that signal Gary Cooper’s date with destiny in High Noon stand in for 12pm; five minutes later, Richard Gere passes an alarm clock that says 12:05pm in American Gigolo; scenes from Picnic at Hanging Rock and Once Upon a Time in the West, both of which feature images or discussions of timepieces, whiz by until—guess what?—it’s 12:08pm. Sync up the reel time to real time, and The Clock doubles as an actual clock, covering the entire dusk-to-dawn expanse of a day and back again through specific (and not-so-specific) references to minutes and hours. Two years in the making, Marclay’s epic time-trawling masterpiece also serves as a vast tour of film history, one that tick-tick-ticks through virtually all of the medium’s decades, genres and national cinemas. 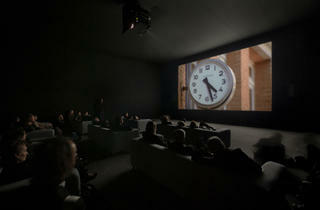 Those who missed out on The Clock during its original New York run at the Paula Cooper Gallery in January of 2011 get another chance to step into this time-coded hall of mirrors when the piece returns to NYC as part of the Lincoln Center Festival on Friday 13. From Tuesday through Thursday between 8am and 10pm, the public is welcome to wander into the David Rubenstein Atrium and sample the visual hodgepodge of pendulums, pocket watches and creeping clock hands; on weekends, the entire 24-hour cycle will run in a loop. Not that Marclay recommends trying to play beat the you-know-what. “Oh, I never encourage people to watch the whole thing,” he says with a chuckle. “It’s not an endurance test! Some folks try to see all of it, but whether or not they’re actually awake once the bit that happens at 4:15am rolls around….” Still, the artist understands the appeal of and the sacrifice involved in trying to see as much of it as possible. “I think part of what makes it work is the fact that viewers are forced to choose: your life schedule versus the screen’s schedule. You know, How long will I allow myself to watch this? Can I skip lunch? Will the babysitter still be there when I get back?" As with his similar, shorter montages—1995’s Telephones and 2002’s four-screen Video Quartet—well-versed movie lovers may find themselves caught up in trying to identify which Bogart movie features him checking his watch or how many different Westerns they can spot. “Given the amount of clips here, it’s difficult to do,” he says. “But the piece is as much about memory as time, and those juxtapositions are designed to both trigger a movie lover’s memory and totally mess with it.” Marclay pauses for a second. “I’ve never been a big cinephile, which may be why I could treat The Clock like a puzzle and force the pieces to fit together in odd ways. But having worked on this project, I enjoy films in a different way now, because I have a better understanding of how complex filmmaking is. When you take something apart, you get a great sense of what it took to originally put it together."